Ridgewood High School was named as one of 10 school districts to be part of a new Illinois State Board of Education competency-based learning pilot program. Previously in the traditional setting, time has been the constant and learning has been the variable. With Competency Education, learning is now the constant and time varies. The goal of Competency Education at Ridgewood is to meet students at their learning level and then provide them the resources and tools to develop their skills. Through weekly mentorship, students build strong relationships, practice goal setting and reflection and complete a Student Success Plan to guide their high school experience. Students demonstrate their learning in various ways including: Project-Based Learning and Personalized Pathways. The first year of the pilot program has been led primarily by the STEM Division - Math Department. At Ridgewood, students are assessed in specific Competencies rather than overall content. Under each Competency Area, students submit evidence through either traditional or performance based assessments that are related to Skills. 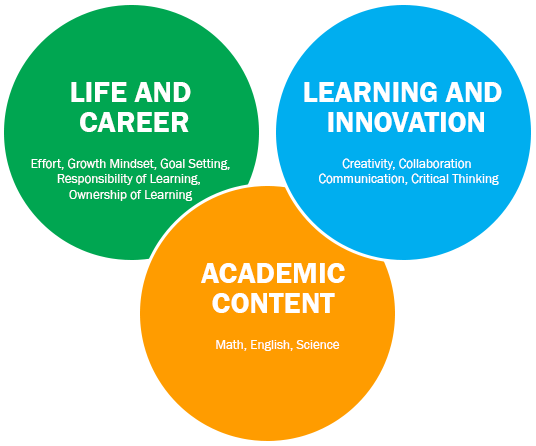 Academic Content Skills align to national learning standards. These Skills are organized into Levels that provide students a clear understanding of their proficiency.